The Flint Center parking garage is now open after having been closed last year for retrofit construction. It costs $10 to park in the garage during a California Pops’ show. In addition to the Flint Center garage, nearby De Anza College student parking lots A and B are also open for parking during California Pops’ shows. To park in a student lot, you must purchase a $3 One-Day Parking Permit from yellow machines located in each student parking lot. Machines take nickels, dimes, quarters, dollar coins and dollar bills. Note that One-Day Permits are only valid in De Anza College student lots. You will receive a ticket if you park in a staff lot (or in a parking space marked “staff”)! 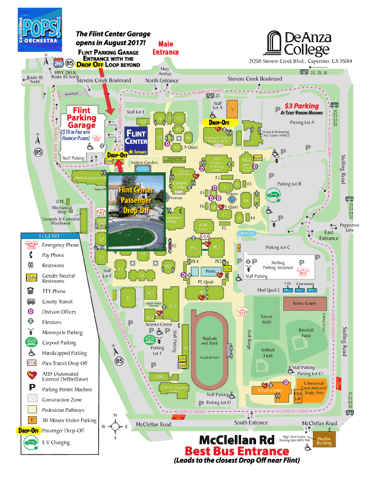 If you are unfamiliar with the Flint Center De Anza College campus, feel free to print or download a PDF of the Flint Center De Anza College Map . Designated “handicap” parking spaces are located on the ground floor of the Flint Center parking garage and in every student parking lot at De Anza College. These spaces may be used by vehicles that display blue or red “handicap” placards or license plates issued by the California State Department of Motor Vehicles. Persons driving such vehicles do not need to pay to park in the Flint Center Parking Garage or the De Anza College student lots and may park in any designated “handicap” parking space, or any student or staff space. 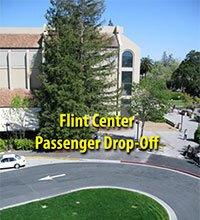 Cars and buses may unload passengers on the west side of Flint Center. The best bus entrance is on the south side of campus off of McClellan Road, which will bring you to the passenger drop-off closest to Flint Center. An alternative passenger drop-off area is located on the northwest corner of Student Lot A. To help orient yourself on the day of the show, feel free to print or download a PDF of the Flint Center De Anza College Map .